LUANG PRABANG, Laos, Dec. 19 (Xinhua) -- Against verdant croplands, the Hadkhae village in northern Laos has quite a modern look: brand new apartment buildings standing alongside broad roads leading to public facilities including a newly-built school, a hospital, a market, and a bridge over the river. A local resident who called himself Kaisone in the village near the landmark Nam Ou River hydropower station project, said he used to be a welder at the project and had earned enough to buy a land, build a house on it and open his own car repair shop. Hadkhae is an immigrant village built by PowerChina Resources Ltd, with a development mode combining "basic agriculture support plus cooperation," i.e. resettled villagers do the farming while the company supplying seeds, fertilizers, tree saplings and farming implements, and helping diversify production so as to enable the locals to make more money. The farm was unaffected by the construction of the hydropower station. Kaisone said. "When they came, they also brought along advanced cultivation techniques. See how well these corn crops have grown!" The local natural landscape has attracted many foreign backpackers to visit, generating more income for villagers, he added. All the changes were triggered by the Nam Ou River hydropower project. It is a major development scheme being carried out as part of the Lao government's ambitious bid to turn the country into "the storage battery in Southeast Asia." It is also a key project within the framework of the Lancang-Mekong Cooperation (LMC) mechanism. The LMC is a sub-regional cooperation mechanism launched in March 2016 by China, Laos, Cambodia, Myanmar, Thailand and Vietnam, all riparian countries of the river called Mekong or Lancang in the upper reach. As of August this year, the first phase of the PowerChina-contracted project put into operation has delivered more than 3 billion kwh of electricity to the north of Laos. The second phase is planned to complete by 2020 and to supply 12 percent of the power need in Laos. A similar project in the Lower Sesan II hydropower project in northeast Cambodia has enormously lifted the living standards in the Kbal Romeas village with new, modern homes, jobs, better roads, a drainage system, clean water and cheap electricity. "The most important thing is that there is a public school and a free-of-charge health center near our house," said Krav Many, a 45-year-old father of three, adding that in the past, a sick man would have to travel 70 km before getting to a health center. The 400-megawatt dam, which is Cambodia's largest, was inaugurated on Monday after almost five years of construction. China's Huaneng Hydrolancang International Energy is its major stakeholder. 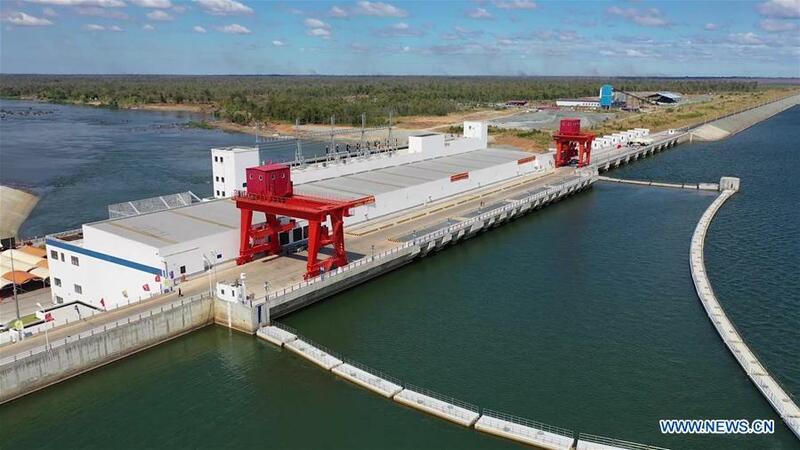 "This is the biggest and the seventh Chinese-built hydropower dam in Cambodia," Prime Minister Samdech Techo Hun Sen said. "It will contribute to ensuring energy security, lowering the price of electricity, and reducing poverty in Cambodia." A Chinese-owned paper mill based in Xepon, Savannakhet Province of Laos, often impresses visitors with its drainage outlets. In the local branch of China's Shandong Sun Paper Group, the waste water discharge port is so clean that many ducks and fish are living there. "All our emission data have met the strictest environmental requirements," said general manager Chen Wenjun. The mill's cutting-edge hardwood pulp production line has an annual output of 300,000 tons. In addition, the plant uses the bark, wood chips and waste liquid to generate electricity. "There is certain profit, but the construction cost of the power station is much higher. Our initial thinking is about environmental protection, waste utilization and emission reduction," Chen said. In Myanmar, in Min Pyin village in the Lewe township, Ms Thei Ma is receiving financial and technical assistance from China under a three-year pilot program on rural poverty reduction launched in February. "When I was pregnant, I had to walk a long way to fetch water. Now I'm so happy to see a well being dug here," said Thei Ma, a mother of two, holding her three-month-old baby girl in her arms. Wells and roads are planned as the first-year tasks, to be followed by providing power access and building a public center, a dam and a school. Afterwards, villagers will be able to learn plantation and irrigation techniques at China-funded training programs. "The project is expected to bring about substantial development and improve our standards of living," said Sow Kyaw Myint, head of the Myanmarese team of the local project. Besides Min Pyin, the village of Aye Chan Thar in the Tatkon township is the other beneficiary of the ongoing poverty reduction project. After attending the 4th Lancang-Mekong Cooperation (LMC) foreign ministers' meeting in the Lao city of Luang Prabang on Monday, Chinese State Councilor and Foreign Minister Wang Yi said that during the past year, the LMC mechanism has achieved many "firsts". They included the first training program for promoting coordination among the six members, implementation of the first LMC-funded projects, and the first Lancang-Mekong forum on water resources cooperation, among others. The LMC countries have also put in place close to 30 major infrastructure projects such as building railways, roads, hydropower stations, and economic development zones, realizing cooperation on production capacity, Wang said. The LMC priority areas have expanded to cover education, media, medicine and youth exchanges, forming a comprehensive cooperation pattern, he added. On the LMC future development, the Chinese foreign minister stressed the consensus reached toward building a Lancang-Mekong economic development belt, further cooperation within the grouping and with other sub-regional blocs, as well as efficiency promotion.